It's rare to find a metal band who are doing something truly different especially in a place like India, so it's a sign of the rapidly rising quality of the scene over there that a band like Midhaven can rise up and thrive. Signed to Universal Music Group you know that there's something special going on with these guys, a band who seem destined to rise up and take the world by storm. Exciting and extremely promising Spellbound is a record that has appeal beyond the metal world and can inspire generations of young fans. 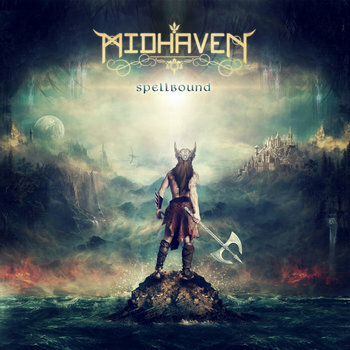 With powerful high pitched cleans soaring out and then being immediately contrasted by soul searing growls, it's easy to see where Midhaven are coming from sonically. They are exciting to listen too if nothing else and songs like Seeking The Divine provide a wealth of aural inspiration. See, the soundscapes of Spellbound are rather innovative and will keep you spinning this record again and again. These guys are truly talented musicians and the way they craft songs is fairly unique. While there are touches of modern metal there is also a lot of prog and romanticism making every piece a veritable masterwork. As you keep spinning this record it's hard not to fall in love with the grooves. You see, in just over half an hour, Midhaven accomplish more emotionally than most bands do in an entire career. Willing to break every boundary, I feel that there is no way these guys are not destined to succeed. So let these songs of innocence and experience find their way into your heart, after all, if we can't unite over something like this, what can we unite over? With such a promising future, Midhaven may very well be set to take over the world.